076. LA CONQUÊTE DU PÔLE NORD. Issued by Nestlé Chocolates. (Date?). Card number 9 from Series No. 39 of an unknown number. Size: Ca. 2.25" x 1.57". 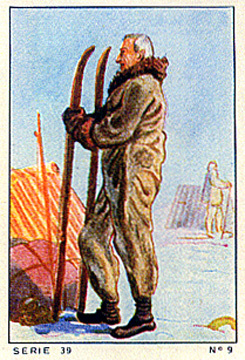 Recto: View of Amundsen standing in profile in polar clothing holding a pair of skiis. Also tent and a second figure. At bottom: SERIE 39 No 9.